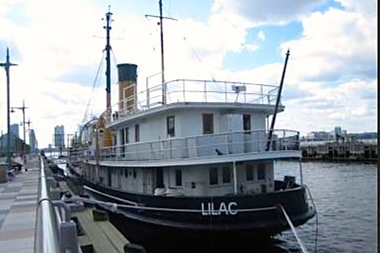 The historic steamship Lilac has been docked at TriBeCa's Pier 25 since May 2011. TRIBECA — To read books at this library, you’ll need your sea legs. A floating library is coming aboard the historic Steamship Lilac, which is docked at Hudson River Park’s Pier 25, at North Moore Street. The gratis pop-up library, the brainchild of artist Beatrice Glow, will transform the main deck of the boat into a outdoor reading lounge, featuring books from “underrepresented” authors as well as art books, poetry and manifestos, according to the artist. The books must remain on the boat. The floating library, which will run from Sept. 6 to Oct. 3, will also offer a variety of free programming, including art installations, performances and political and creative workshops and discussions. Books from the library will eventually be donated to local high school students “with demonstrated need,” according to the floating library website. The library's organizers will ask visitors turn off their cellphones to maintain a quiet space that allows people to appreciate the books. “The library afloat on water is always on the verge to sail into the distance just as books contain the magic to transport our minds to unknown terrains,” the project's website reads. The Lilac is now a museum, but it was previously a U.S. Coast Guard vessel build in 1933 to carry supplies to lighthouses. The ship is open 4 to 7 p.m. on Thursdays and 2 to 7 p.m. on the weekends. Visit the Floating Library website for more information.